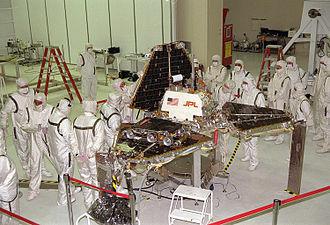 MESUR, the Mars Environmental SURvey was a NASA program designed to explore the planet Mars in preparation for human follow-up missions of the Space Exploration Initiative. The only mission of the program that was completed was MESUR Pathfinder. MESUR was a planned set of 16 surface missions on Mars that would also set up a planetary network across Mars and work in conjunction with Mars Observer. 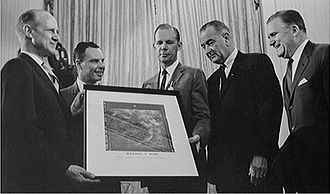 [dead link] The original plan was proposed by NASA Ames, but it would eventually include ideas from the competing JPL proposal. It was envisioned as a low-cost method of surveying Mars, with risk tolerance, since a loss of a spacecraft was not fatal to the program, because of multiple relatively cheap space probes. MESUR Pathfinder would be the pathfinder mission for the MESUR program. MESUR regular missions would start landing in 1999. The multi-year MESUR would have 16 more landers, landing in the projected period of 1999-2003,[dead link] and lasting 10 years. Launches would start in 1996. [dead link] Several of the landers would carry Sojourner-class rovers. [dead link] The entire program was projected at a cost of $1 billion US, with per annum spending restricted to $150 million US, starting in FY1994. They were planned to be low-cost missions to Mars, instead of multibillion-dollar missions. The rovers and landers would have instruments and cameras to examine surface rocks, search for water, perform seismography, and observe meteorology. The seismology experiments would help determine the internal structure of Mars. After Pathfinder, in 1999, four landers would be launched in a single rocket. At the next launch window in 2001, four more landers would again launch in on a single rocket. Finally in 2003, the last eight landers would launch on two rockets. On 26 June 1992, NASA unveiled the prototype for Mars Sojourner, Rocky IV, on the 25th anniversary of the first US lunar lander. The MESUR Pathfinder was launched on December 4, 1996 by NASA aboard a Delta II. After a 7-month voyage it landed on Ares Vallis, in a region called Chryse Planitia on Mars, on 4 July 1997. During its voyage the spacecraft had to accomplish four flight adjustments on 10 January, 3 February, 6 May and 25 June. 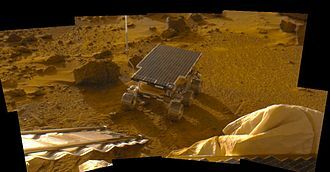 The lander opened, exposing the rover called Sojourner that would go on to execute many experiments on the Martian surface. 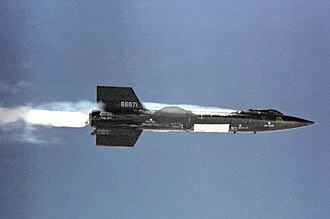 Although the mission was programmed to last a week to a month, it eventually lasted for almost three months. The final contact with the Pathfinder was at 10:23 UTC on September 27, 1997. 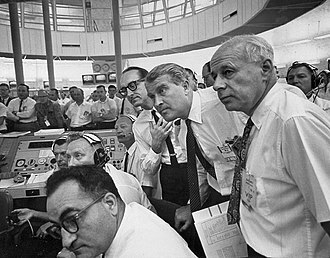 Although the mission planners tried to restore contact during the following five months, the successful mission was terminated on March 10, 1998. After the landing, the Mars Pathfinder was renamed as the Sagan Memorial Station in honor of the famous astronomer and planetologist Carl Sagan. 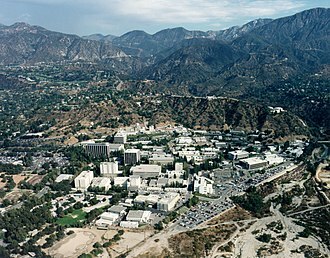 The mission had exceeded its goals in the first month. 2001 Mars Odyssey is a robotic spacecraft orbiting the planet Mars. The project was developed by NASA, and contracted out to Lockheed Martin and its mission is to use spectrometers and a thermal imager to detect evidence of past or present water and ice, as well as study the planets geology and radiation environment. It acts as a relay for communications between the Mars Exploration Rovers, Mars Science Laboratory, and previously the Phoenix lander to Earth, the mission was named as a tribute to Arthur C. Clarke, evoking the name of 2001, A Space Odyssey, Odyssey was launched April 7,2001, on a Delta II rocket from Cape Canaveral Air Force Station, and reached Mars orbit on October 24,2001, at 02,30 UTC. It is currently in an orbit around Mars with an altitude of about 3,800 km or 2,400 miles. 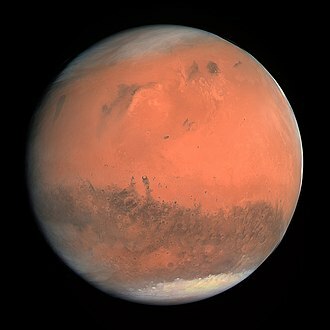 By December 15,2010, it broke the record for longest serving spacecraft at Mars, with 3,340 days of operation, claiming the title from NASAs Mars Global Surveyor. It currently holds the record for the longest-surviving continually active spacecraft in orbit around a planet other than Earth, ahead of the Pioneer Venus Orbiter, Mars Odyssey was originally a component of the Mars Surveyor 2001 program, and was named the Mars Surveyor 2001 Orbiter. Subsequently, the name 2001 Mars Odyssey was selected for the orbiter as a tribute to the vision of space exploration shown in works by Arthur C. Clarke, including 2001, A Space Odyssey, the music from Mythodea by Greek composer Vangelis was used as the theme music for the mission. 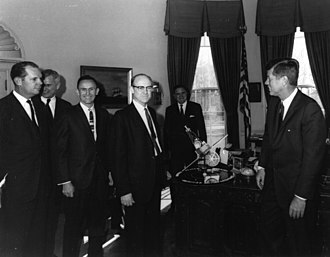 In August 2000, NASA solicited candidate names for the mission, which were evaluated by a committee consisting of Mark Dahl, Michael Meyer, Steve Saunders. Out of 200 names submitted, the committee chose Astrobiological Reconnaissance and Elemental Surveyor, faced with criticism that this name was not very compelling, and too aggressive, the naming committee reconvened. The candidate name 2001 Mars Odyssey had earlier been rejected because of copyright, however, NASA e-mailed Arthur C. Clarke in Sri Lanka, who responded that he would be delighted to have the mission named for his books, and he had no objections. On September 20, NASA associate administrator Ed Weiler wrote to the administrator for public affairs recommending a name change from ARES to 2001 Mars Odyssey. Mariner 4 was the fourth in a series of spacecraft intended for planetary exploration in a flyby mode. It was designed to conduct closeup scientific observations of Mars and to transmit these observations to Earth, launched on November 28,1964, Mariner 4 performed the first successful flyby of the planet Mars, returning the first pictures of the Martian surface. It captured the first images of another planet ever returned from space, their depiction of a cratered. On December 21,1967 communications with Mariner 4 were terminated, the Mariner 4 spacecraft consisted of an octagonal magnesium frame,127 cm across a diagonal and 45.7 cm high. Four solar panels were attached to the top of the frame with a span of 6.88 meters. A116.8 cm diameter parabolic antenna was mounted at the top of the frame as well. An omnidirectional low-gain antenna was mounted on a seven foot, four inch tall mast next to the high-gain antenna, the overall height of the spacecraft was 2.89 meters. The octagonal frame housed the equipment, midcourse propulsion system. A trapped radiation detector, mounted on the body with counter-axes pointing 70° and 135° from the direction, to measure the intensity. A cosmic ray telescope, mounted inside the body pointing in direction, to measure the direction and energy spectrum of protons. A solar plasma probe, mounted on the body pointing 10° from the solar direction, a cosmic dust detector, mounted on the body with microphone plate approximately perpendicular to the plane of orbit, to measure the momentum, distribution and direction of cosmic dust. A television camera, mounted on a platform at the bottom center of the spacecraft. Carl Edward Sagan was an American astronomer, astrophysicist, author, science popularizer, and science communicator in astronomy and other natural sciences. He is best known for his work as a science popularizer and his best known scientific contribution is research on extraterrestrial life, including experimental demonstration of the production of amino acids from basic chemicals by radiation. Sagan argued the now accepted hypothesis that the surface temperatures of Venus can be attributed to. Sagan published more than 600 scientific papers and articles and was author, co-author or editor of more than 20 books. He wrote many science books, such as The Dragons of Eden, Brocas Brain and Pale Blue Dot. The most widely watched series in the history of American public television, the book Cosmos was published to accompany the series. He wrote the science fiction novel Contact, the basis for a 1997 film of the same name and his papers, containing 595,000 items, are archived at The Library of Congress. Sagan always advocated scientific skeptical inquiry and the method, pioneered exobiology. He spent most of his career as a professor of astronomy at Cornell University and he married three times and had five children. After suffering from myelodysplasia, Sagan died of pneumonia at the age of 62, Carl Sagan was born in Brooklyn, New York. His father, Samuel Sagan, was an immigrant garment worker from Kamianets-Podilskyi, Russian Empire and his mother, Rachel Molly Gruber, was a housewife from New York. Carl was named in honor of Rachels biological mother, Chaiya Clara, in Sagans words and he had a sister and the family lived in a modest apartment near the Atlantic Ocean, in Bensonhurst, a Brooklyn neighborhood. According to Sagan, they were Reform Jews, the most liberal of North American Judaisms four main groups, both Sagan and his sister agreed that their father was not especially religious, but that their mother definitely believed in God, and was active in the temple. During the depths of the Depression, his father worked as a theater usher, according to biographer Keay Davidson, Sagans inner war was a result of his close relationship with both of his parents, who were in many ways opposites. Viking 1 was the first of two spacecraft sent to Mars as part of NASAs Viking program. On July 20,1976, it became the first spacecraft to land successfully on Mars, Viking 1 held the record for the longest Mars surface mission of 2307 days or 2245 sols until that record was broken by Opportunity on May 19,2010. Following launch using a Titan/Centaur launch vehicle on August 20,1975, and a 10-month cruise to Mars, the orbiter began returning global images of Mars about 5 days before orbit insertion. The Viking 1 Orbiter was inserted into Mars orbit on June 19,1976, landing on Mars was planned for July 4,1976, the United States Bicentennial, but imaging of the primary landing site showed it was too rough for a safe landing. The landing was delayed until a site was found, and took place instead on July 20. The lander separated from the orbiter at 08,51 UTC and it was the first attempt by the United States at landing on Mars. The instruments of the orbiter consisted of two cameras for imaging, an infrared spectrometer for water vapor mapping and infrared radiometers for thermal mapping. The orbiter primary mission ended at the beginning of solar conjunction on November 5,1976, the extended mission commenced on December 14,1976, after solar conjunction. Operations included close approaches to Phobos in February 1977, the periapsis was reduced to 300 km on March 11,1977. Operations were terminated on August 17,1980, after 1485 orbits, a 2009 analysis concluded that, while the possibility that Viking 1 had impacted mars could not be ruled out, it was most likely still in orbit. The lander and its aeroshell separated from the orbiter on July 20 at 08,51 UTC, at the time of separation, the lander was orbiting at about 5 kilometres per second. The aeroshells retrorockets fired to begin the lander de-orbit maneuver, after a few hours at about 300 kilometres altitude, the lander was reoriented for atmospheric entry. The aeroshell with its heat shield slowed the craft as it plunged through the atmosphere. During this time, entry science experiments were performed by using a retarding potential analyzer, a spectrometer, as well as pressure, temperature. 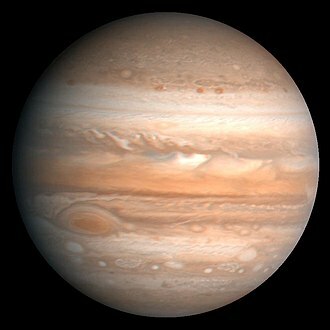 Astronomy is a natural science that studies celestial objects and phenomena. It applies mathematics and chemistry, in an effort to explain the origin of those objects and phenomena and their evolution. 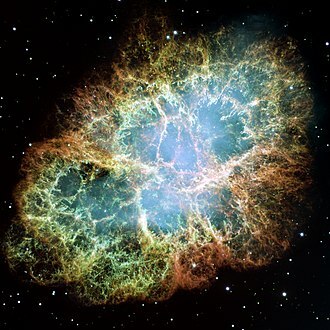 Objects of interest include planets, stars and comets, while the phenomena include supernovae explosions, gamma ray bursts, more generally, all astronomical phenomena that originate outside Earths atmosphere are within the purview of astronomy. A related but distinct subject, physical cosmology, is concerned with the study of the Universe as a whole, Astronomy is the oldest of the natural sciences. The early civilizations in recorded history, such as the Babylonians, Indians, Nubians, Chinese, during the 20th century, the field of professional astronomy split into observational and theoretical branches. 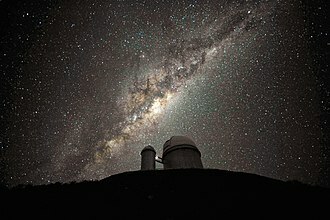 Observational astronomy is focused on acquiring data from observations of astronomical objects, theoretical astronomy is oriented toward the development of computer or analytical models to describe astronomical objects and phenomena. The two fields complement each other, with theoretical astronomy seeking to explain the results and observations being used to confirm theoretical results. Astronomy is one of the few sciences where amateurs can play an active role, especially in the discovery. Amateur astronomers have made and contributed to many important astronomical discoveries, Astronomy means law of the stars. Astronomy should not be confused with astrology, the system which claims that human affairs are correlated with the positions of celestial objects. Although the two share a common origin, they are now entirely distinct. Generally, either the term astronomy or astrophysics may be used to refer to this subject, since most modern astronomical research deals with subjects related to physics, modern astronomy could actually be called astrophysics. Few fields, such as astrometry, are purely astronomy rather than astrophysics, some titles of the leading scientific journals in this field includeThe Astronomical Journal, The Astrophysical Journal and Astronomy and Astrophysics. 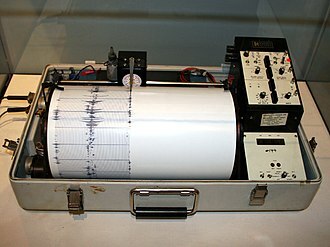 Seismometers are instruments that measure motion of the ground, including those of seismic waves generated by earthquakes, volcanic eruptions, and other seismic sources. Records of seismic waves allow seismologists to map the interior of the Earth, the seismometer was invented by the Chinese polymath Zhang Heng in AD132 during the Han dynasty. The first Western description of a comes from the French physicist and priest Jean de Hautefeuille in 1703. 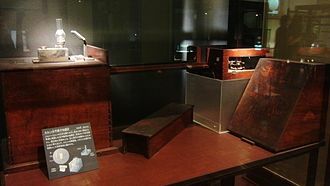 The modern seismometer was developed in the 19th century by John Milne, James Alfred Ewing, seismograph is another Greek term from seismós and γράφω, gráphō, to draw. 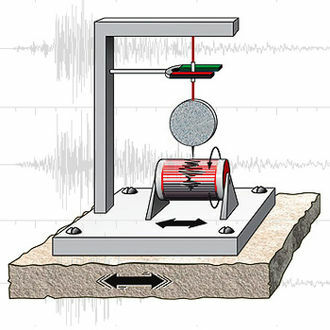 The concerning technical discipline is called seismometry, a branch of seismology, a simple seismometer that is sensitive to up-down motions of the earth can be understood by visualizing a weight hanging on a spring. The spring and weight are suspended from a frame that moves along with the earthʼs surface, as the earth moves, the relative motion between the weight and the earth provides a measure of the vertical ground motion. Any movement of the moves the frame. The mass tends not to move because of its inertia, early seismometers used optical levers or mechanical linkages to amplify the small motions involved, recording on soot-covered paper or photographic paper. In some systems, the mass is held nearly motionless relative to the frame by a negative feedback loop. The motion of the relative to the frame is measured. The voltage needed to produce this force is the output of the seismometer, in other systems the weight is allowed to move, and its motion produces a voltage in a coil attached to the mass and moving through the magnetic field of a magnet attached to the frame. This design is used in the geophones used in seismic surveys for oil. Professional seismic observatories usually have instruments measuring three axes, north-south, east-west, and the vertical, if only one axis is measured, this is usually the vertical because it is less noisy and gives better records of some seismic waves. The foundation of a station is critical. A professional station is mounted on bedrock. The Mars 2 was an unmanned space probe of the Mars program, a series of unmanned Mars landers and orbiters launched by the Soviet Union in the early 1970s. The Mars 2 and Mars 3 missions consisted of identical spacecraft, each with an orbiter, the orbiter is identical to the Venera 9 bus or orbiter. They were launched by a Proton-K heavy launch vehicle with a Blok D upper stage, the lander of Mars 2 became the first man-made object to reach the surface of Mars, although the landing system failed and the lander was lost. On May 19,1971, the proton-k-2 blasted from Baikonur Cosmodrome, after the first stage separated the second stage started. The third stage engine blasted Mars 2 into parking orbit the Blok-d sent Mars 2 to Mars, scientific instruments were generally turned on for about 30 minutes near periapsis. By coincidence, a large dust storm on Mars adversely affected the mission. 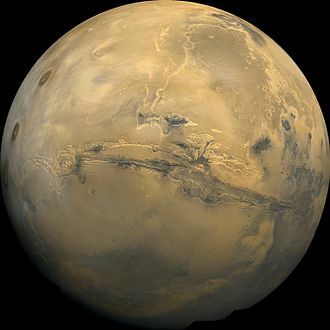 The Mars 2 orbiter sent back data covering the period from December 1971 to March 1972 and it was announced that Mars 2 and Mars 3 had completed their missions by 22 August 1972, after 362 orbits. The probe, combined with Mars 3, sent back a total of 60 pictures, the images and data revealed mountains as high as 22 km, atomic hydrogen and oxygen in the upper atmosphere, surface temperatures ranging from −110 °C to +13 °C, surface pressures of 5. The images and data enabled the creation of surface relief maps, the orbiter remains in Martian orbit. The Mars 2 descent module was mounted on the bus/orbiter opposite the propulsion system and it consisted of a spherical 1.2 m diameter landing capsule, a 2.9 m diameter conical aerodynamic braking shield, a parachute system and retro-rockets. The entire descent module had a mass of 1210 kg. An automatic control system consisting of gas micro-engines and pressurised nitrogen containers provided attitude control, four gunpowder engines were mounted to the outer edge of the cone to control pitch and yaw. 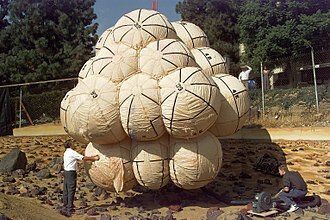 The main and auxiliary parachutes, the engine to initiate the landing, foam was used to absorb shock within the descent module. The landing capsule had four triangular petals which would open after landing, righting the spacecraft and it contained a pennant with the State Emblem of the Soviet Union. Mariner 9 was an unmanned NASA space probe that contributed greatly to the exploration of Mars and was part of the Mariner program. After months of dust storms it managed to send clear pictures of the surface. Mariner 9 returned 7329 images over the course of its mission, an infrared radiometer was included to detect heat sources in search of evidence of volcanic activity. It was to study changes in the Martian atmosphere and surface. Mars two moons were to be analyzed, Mariner 9 more than met its objectives. NASA still held out hope that another Mariner probe and Atlas-Centaur could be readied before the 1971 Mars launch window closed, Convair had an available Centaur stage on hand and could have an Atlas readied in time, but the idea was ultimately abandoned for lack of funding. Mariner 9 was mated to Atlas-Centaur AC-23 on May 9 with investigation into Mariner 8s failure ongoing, all testing came back negative and on May 22, a tested and verified rate gyro package arrived from Convair and was installed in the Centaur. Liftoff took place on May 30 at 5,23 PM EST, all launch vehicle systems performed normally and the Mariner separated from the Centaur at 13 minutes and 18 seconds after launch. Mariner 9 was the first spacecraft to orbit another planet, when Mariner 9 arrived at Mars on November 14,1971, planetary scientists were surprised to find the atmosphere was thick with a planet-wide robe of dust, the largest storm ever observed. Mariner 9s computer was reprogrammed from Earth to delay imaging of the surface for a couple of months until the dust settled. The main surface imaging did not get underway until mid-January 1972 and this unexpected situation made a strong case for the desirability of studying a planet from orbit rather than merely flying past. It highlighted the importance of flexible mission software, the images revealed river beds, massive extinct volcanoes, evidence of wind and water erosion and deposition, weather fronts and more. Mars small moons and Deimos, were photographed, the findings from the Mariner 9 mission underpinned the Viking program. The Trace Gas Orbiter delivered the Schiaparelli lander and will start atmospheric mapping in 2017. A key goal is to gain an understanding of methane. The landers radio signal was lost during the descent through the Mars atmosphere, investigations with space and Earth-based observatories have demonstrated the presence of a small amount of methane on the atmosphere of Mars that seems to vary with location and time. This may indicate the presence of life on Mars, or a geochemical process such as volcanism or hydrothermal activity. ExoMars Trace Gas Orbiter was born out of the nexus of ESAs Aurora programme ExoMars flagship and it became a flexible collaborative proposal within NASA and ESA to send a new orbiter-carrier to Mars in 2016 as part of the European-led ExoMars mission. 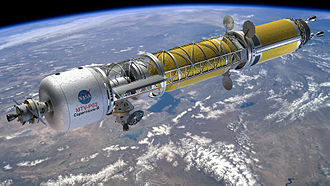 On the ExoMars side, ESA authorized about half a billion Euros in 2005 for a rover and mini-station, NASAs Mars Science Orbiter was originally envisioned in 2008 as an all-NASA endeavour aiming for a late 2013 launch. 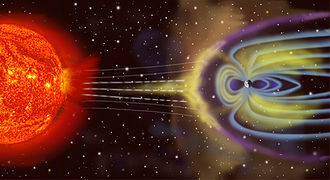 NASA and ESA officials agreed to pool resources and technical expertise, with NASAs funding for this project cancelled, most of ExoMars plans had to be restructured. The Trace Gas Orbiter and descent module Schiaparelli completed testing and were integrated to a Proton rocket at the Baikonur Cosmodrome in Kazakhstan in mid-January 2016, the launch occurred at 09,31 UTC on 14 March 2016. Four rocket burns occurred in the following 10 hours before the descent module, a signal from the spacecraft was received at 21,29 UTC that day, confirming that the launch was successful and the spacecraft were functioning properly. Briefing reporters in Moscow, the head of Roscosmos denied any anomaly, the Schiaparelli lander separated from the TGO orbiter on 16 October 2016, three days before it arrived on Mars, and entered the atmosphere at 21,000 km/h. The landers radio signal was lost during the descent through the atmosphere, and as of 20 October 2016, the FREND instrument will map hydrogen levels to a maximum depth of 1 m beneath the Martian surface. Locations where hydrogen is found may indicate water-ice deposits, which could be useful for future crewed missions, the mission will characterise spatial, temporal variation, and localisation of sources for a broad list of atmospheric trace gases. If methane is found in the presence of propane or ethane, however, if methane is found in the presence of gases such as sulfur dioxide, that would be an indication that the methane is a byproduct of geological processes. Detection The nature of the methane source requires measurements of a suite of trace gases in order to characterise potential biochemical and geochemical processes at work. Detection sensitivities are at levels of 100 parts per trillion, improved to 10 parts per trillion or better by averaging spectra which could be taken at several spectra per second, to achieve the spatial resolution required to localise sources might require tracing molecules at parts-per-billion concentrations. Like the Mars Reconnaissance Orbiter, the Trace Gas Orbiter is a hybrid science and its scientific payload mass is about 113.8 kg and consists of, The Nadir and Occultation for Mars Discovery has two infrared and one ultraviolet spectrometer channels. Cruise stage is tested in 2010. Pahrump Hills as viewed by the Curiosity rover (2014).